Puzzled Looks explores the intersection of bold shape, color, idiosyncratic design and more subtle narrative references of Isaac Tin Wei Lin and Leif Goldberg. Leif Goldberg (b. 1975) studied film animation at Rhode Island School of Design, began screen printing at Fort Thunder, and has since produced many prints, paintings, films and publications. His images draw from a wide range of influences, as varied as Eastern European Animation, Art Deco, Noise, Naturalism and Science Fiction. He lives in Vermont. 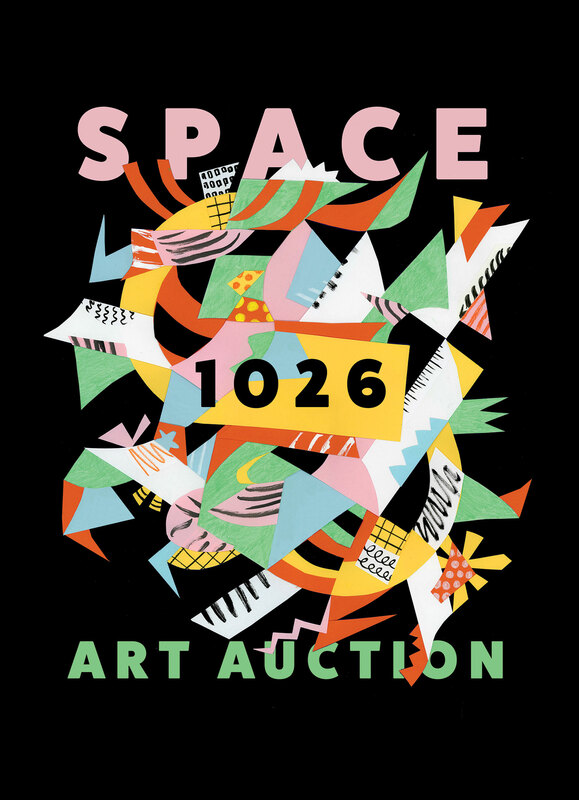 This exhibition is the second to last art show Space 1026 will be having at 1026 Arch Street. Space 1026 is excited to welcome Layqa Nuna Yawar to our gallery this November for his exhibition Forever/Siempre. We hope you can join us for the opening on Friday, November 2 from 6-10pm! 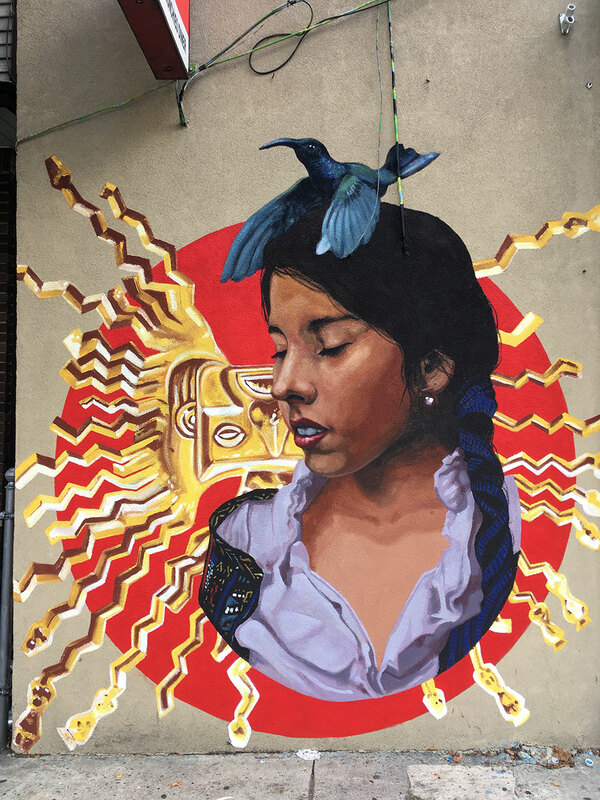 Layqa Nuna Yawar’s murals can be found in public spaces around the world, monumentally inscribing silenced narratives of people of color from the Americas and from across the globe. Born in Ecuador, having migrated to the U.S. as a teenager, and now living and working in Newark, NJ, Layqa Nuna Yawar makes work that questions injustice, racism, and xenophobia while celebrating cross-cultural identity and migration. Frequently working with host communities to realize public art projects, Layqa Nuna Yawar uses his art practice to create safe spaces for imagination and identity projection. 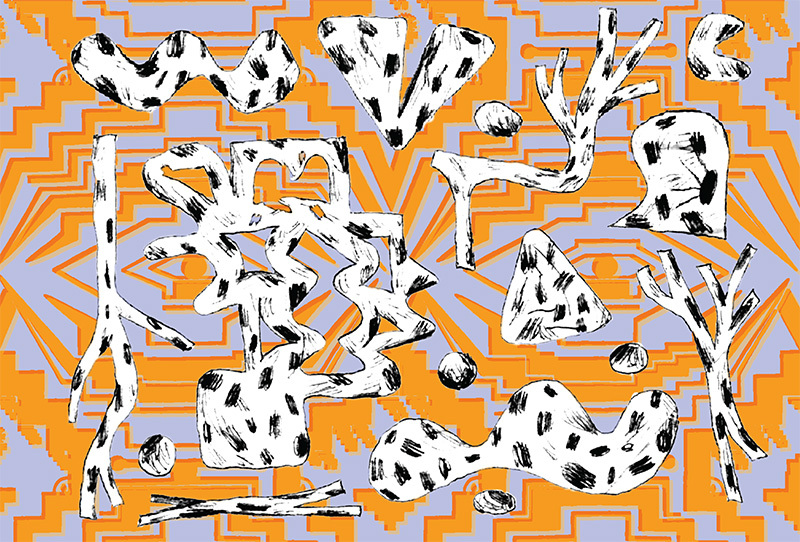 Layqa Nuna Yawar’s artwork developed out of a traditional visual arts education, a practice of street art interventions and independent self-organization principles. His practice extends to curation, project production, mural making workshops and educational lectures. Among many other collaborations and social justice initiatives, Layqa Nuna Yawar is currently working on educational programming for an upcoming project with Mural Arts Philadelphia. He is also a fellow at Open Society Foundations, and his work in the foundation’s Moving Walls project was recently covered by the New York Times and NPR. 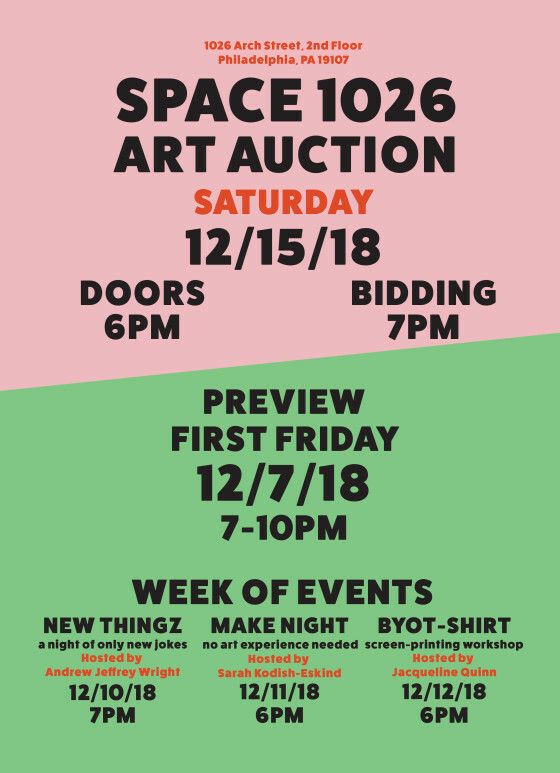 Sadly, this is our final scheduled exhibition at 1026 Arch Street after over 20 years of exhibitions, events, and non-stop art making in our unique home. Come out to the opening and help share good vibes for our relocation! We even put this on facebook! 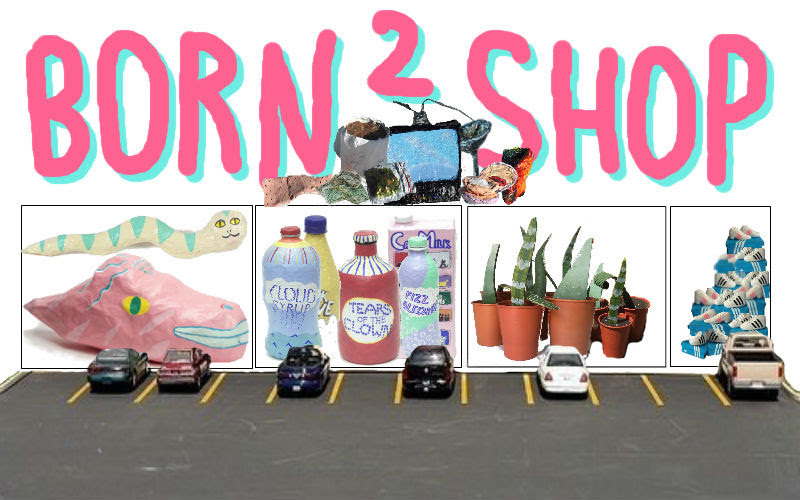 Born 2 Shop opens this Friday at Space 1026! 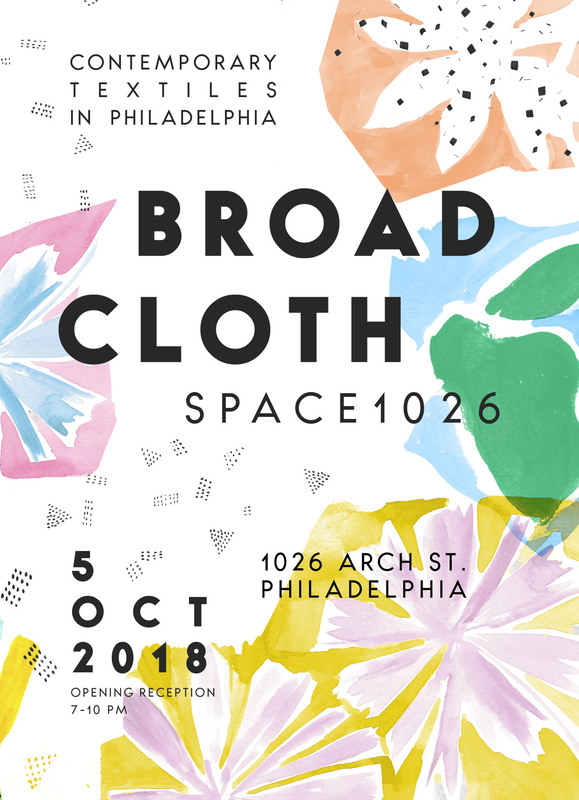 Space 1026 is excited to present Born 2 Shop, a group exhibition featuring Emilia Brintnall, Mackenzie McAlpin, Dawn Riddle, Erica Schapiro-Sakashita, and Sophie White. Where can you go when you’re filled with need, when your physical as well as emotional cupboards are bare? You need a place that has IT ALL. A strip mall. And because you’re a cool city night life type, all the better that the strip mall is located in an art gallery. And also because you are emotionally connected to the earth, you’ll be happy to hear that a lot of the strip mall products are basically just painted over pieces of garbage. Um, I mean they’re upcycled. Or actually, I mean to say they are repurposed. You can just go to ONE PLACE (1026 Arch St.) and get all the plants, miniatures, pets, drinks, *AND MORE* that you NEED. Because your time is almost as valuable as our fine items. Emilia Brintnall is an artist based in Philadelphia. Working in a variety of mediums, she primarily works in paper mache, producing sculpture. Her sculptural work encompasses everyday objects, animals, and plants that are lumpy, seemingly playful versions of their real-world selves. With over 200 successful exhibitions under her belt, Mackenzie McAlpin is a seasoned professional artist. She focuses on the sensual nature of real life and makes it small with clay. Her work was cited in New York Magazine, they even included photos. Ohh… And she was mentioned in the New York Times! 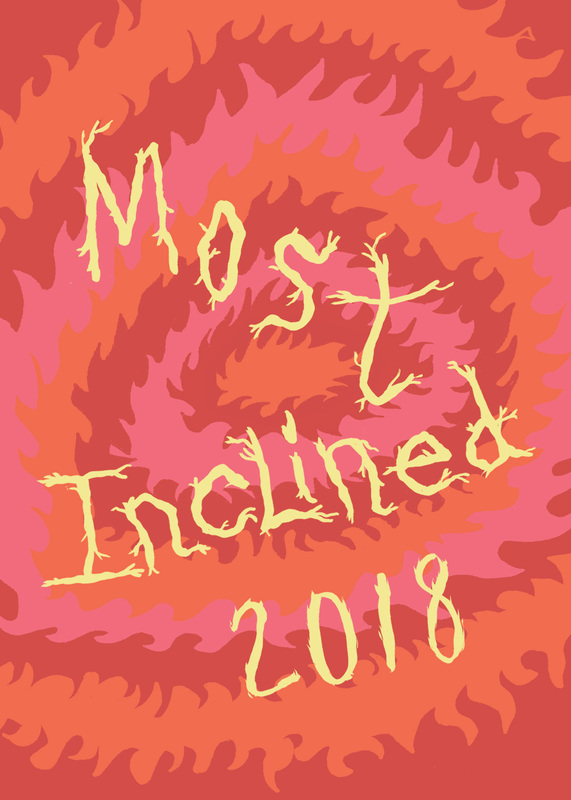 She went to college at Ohio University for Photography and Retail Merchandising (for real) (she actually designed her own major…she doesn’t think that was the “best” idea). Now she lives in Philly, makes things because she loves to, has rad friends, two cats, awesome siblings and a dope boyfriend. She also copied part of this bio from Pinterest. Erica Schapiro-Sakashita is an artist and illustrator based in Oakland, CA. Largely informed by a career in horticulture, her work explores how plant and human communities impact one another. Sophie White, born 1984 in New York, NY, lives and works in Philadelphia, PA. She holds an MFA from the Pennsylvania Academy of Fine Arts and a BFA from the Cooper Union School of Art. 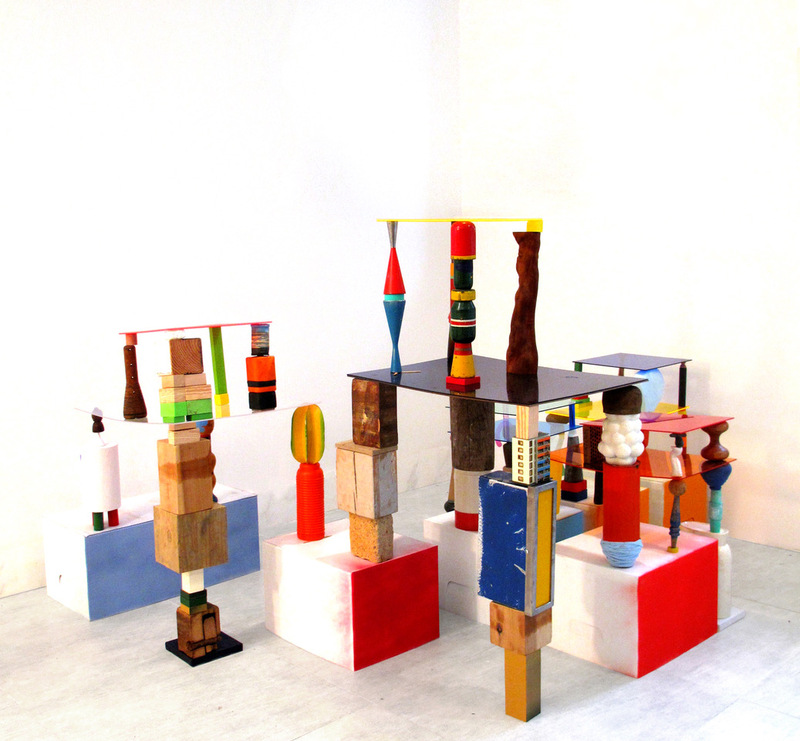 Her humorous, crafty sculptures have been exhibited in group-shows in New York, Philadelphia, Paris and Raleigh, NC. In 2011 they were the subject of a solo show at Magic Pictures Gallery in Philadelphia. Sophie frequently exhibits her cityscape paintings, and is known for her percussive performances with numerous musical groups as well. Leif Low-Beer is interested in the idea that an installation, sculpture, or drawing can be a form of description – a way of telling stories that are familiar to us, but that cannot be expressed in words. His work explores the mute in-between of things: between known and unknown, sayable and unsayable, flat and dimensional. The independence of a small composition pulls against the order imposed by a larger environment – not entirely of it, but not fully apart from it either.Low-Beers work bears the marks of this narrative process, but the story remains open-ended and ambiguous, shifting through multiple frames and tellings. A piece often begins with a single object and moves outwards. The product and discards of his environment become incorporated into the work. Removed from their purpose and context, these objects are marks and begin to structure the kinds of stories that can be told. The sense of a given place comes to underwrite the work as a whole – from the selection (and availability) of materials, to the feeling for story itself.Throughout the process, he attempts to keep his movements spontaneous, maintaining a sense of openness and improvisation while staying within a larger set of rules and structures. A finished drawing sits first at the base of one assemblage, then becomes the backdrop for a different piece. A found-object offers him a new shape to work with, and becomes part of the life of the studio. Pieces meet and marry, living happily together — until perhaps they grow apart. Leif Low-Beer was raised in Toronto and lives and works in Brooklyn and Berlin. His work explores the relationship between 2d and 3d environments, using a combination of drawing, found objects, photography, and sculpture. He has created installations for galleries both nationally, and internationally for the past 10 years. Leif studied philosophy and visual art at the University of Guelph in Canada and School of Visual Arts in New York City. 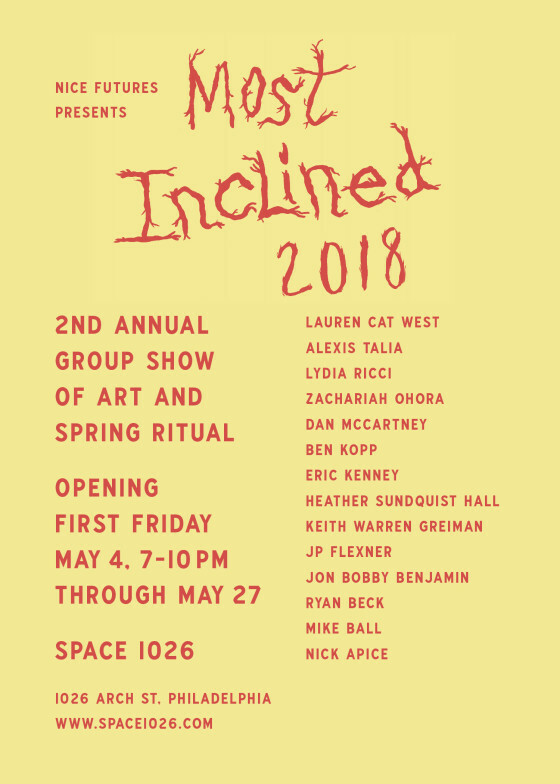 2nd Annual Group Show of Art and Spring Ritual. Opening First Friday May 4th, 7-10pm. Show runs through May 27. 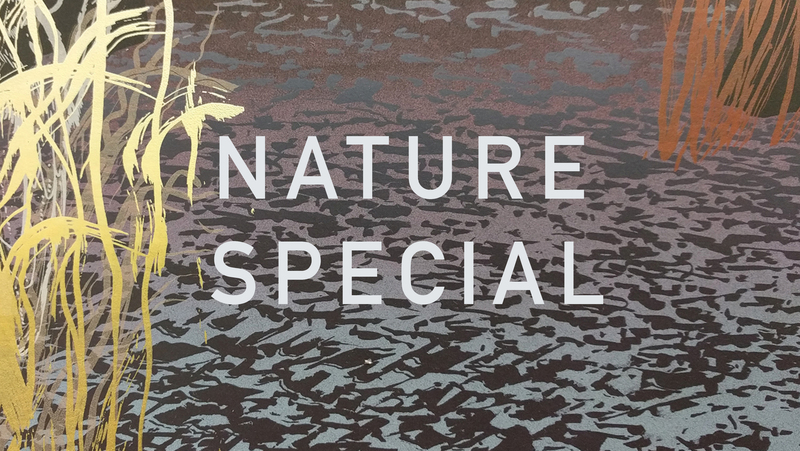 Space 1026 is pleased to present Nature Special, which brings together new and recent work by Scott Porcelli and Ash Limés Castellana. 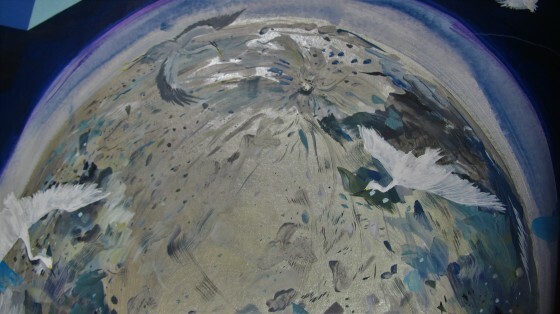 Both artists share a common interest in the outside world, specifically in the many wonders of water, as well as the life and land that exist around it. We are presented with the personal relationship between individual and nature, as both artists have developed their own communication with it. 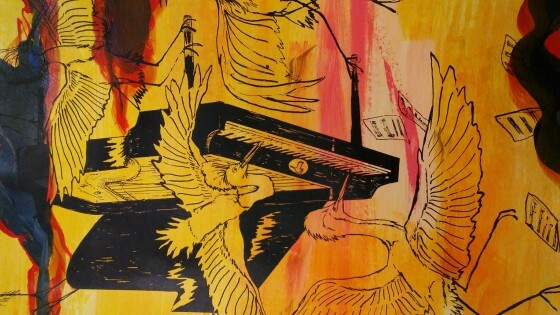 With Porcelli’s prints and paintings of water birds we catch a glimpse of the wonder and whimsy that seems to occupy his thoughts anytime he hears a birdsong. In Castellana’s more restrained drawings and prints, we see the various patterns and forms that exist in the natural world, which are often overlooked while viewing the landscape as a whole. Castellana and Porcelli combined their worlds in a series of collaborative screen prints with hand drawn elements, which they created together at Second State Press, where they first met. Limés Castellana’s artistic practice seeks to promote a connection with ourselves and the natural world by encouraging focused attention on a limited landscape. When experiencing a natural expanse, she begins by reducing it into components. Forest, river, form, line, pattern. Looking at something so vast becomes more manageable when broken down into these parts, fading out the activity around it. 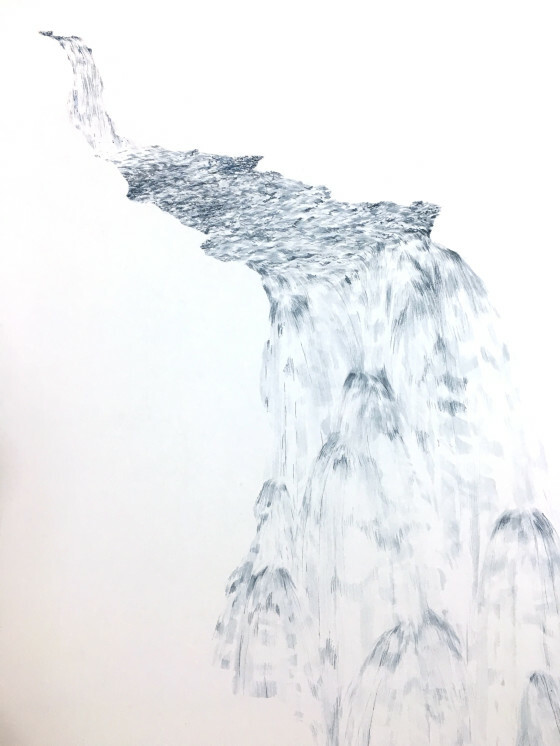 In this series, she has reduced the landscape to emphasize water and how the solid mass of the land informs its surroundings.Through the process of drawing and printmaking she hopes to record these observations and provide a tool for reflection. 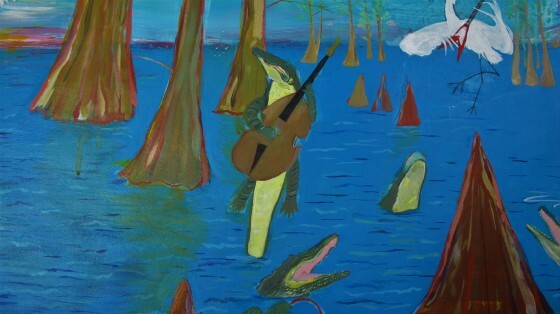 Porcelli’s works are inspired by a love of birds and the Florida Everglades; a colorful backdrop rich in biodiversity. The Everglades are home to over 46 bird species from bald eagles to flamingos which is exciting for bird lovers, and cool. Nature hikes and long walks have nurtured his deep connection to the natural world, and countless daydreams along the way. This series depicts a playful narrative of birds within their hidden habitats. Through his work, Porcelli hopes to key the viewer in on the complex social systems, behaviors, and communities of our aviary friends, through humourous motifs, that provide insight to the connections between birds and their neighbors. Ash Limés Castellana teaches screenprinting at Second State Press and children’s art education at the Philadelphia Museum of Art. 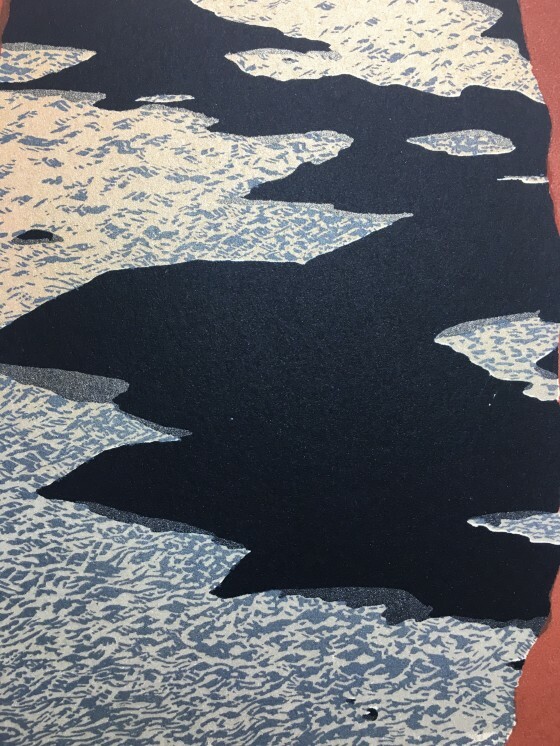 She has nurtured her printmaking skills with organizations such as The Print Center, The Fabric Workshop and Museum, The Women’s Studio Workshop, Space 1026, and as a Textile Printer at Galbraith & Paul. She holds a BFA in Printmaking and Art History from Temple University. Certain rocks tend to make her smile. Scott Porcelli is a printmaking instructor and product coordinator at the Center for Creative Works a studio for adults with intellectual disabilities. He is a former studio manager and a fob holder at Second State Press. Scott likes to party, but that really means he spends a lot of time listening to music and drawing in his room. Scott Porcelli holds an MFA in printmaking from Edinboro University of PA.
Jaither West’s paintings engage with both homage and reportage. As an avid breakdancer, he pays tribute to the history of hip-hop for inspiration, painting the personalities of hip-hop’s golden era. West also paints from current events and daily life, including political campaigns and his daily commute. His work has always explored the details of the activity and the people who inhabit or pass through the city of Philadelphia. He paints to record memories and draw attention to important but often marginalized moments in history. West’s work is a way for him to experience history, communicate his passions and honor those whom he respects. Within the past year he has begun painting on a larger more immersive scale. This scale allows him to condense and include more information creating a richer history and creates an environment for the viewer to physically enter. Whether about breakdancing or historical figures, the paintings give him a platform to share the things he is passionate about with a larger audience. West continues to explore the history of hip-hop and breakdancing through his installation and mural at Space 1026. Each piece of information recorded in his paintings takes him down a new path of discovery and allows his stream of consciousness to explore whatever new topics open up to him. Jaither West (b. 1988) is a self-taught painter living and working in Philadelphia. His work focuses on his everyday life—from famous personalities like Michael Jackson and John F. Kennedy to the individuals he sees every day on his commute. West often incorporates his daily activities and experiences into his paintings through the presence of himself breakdancing or through his densely rendered paintings and drawings of his SEPTA commute. 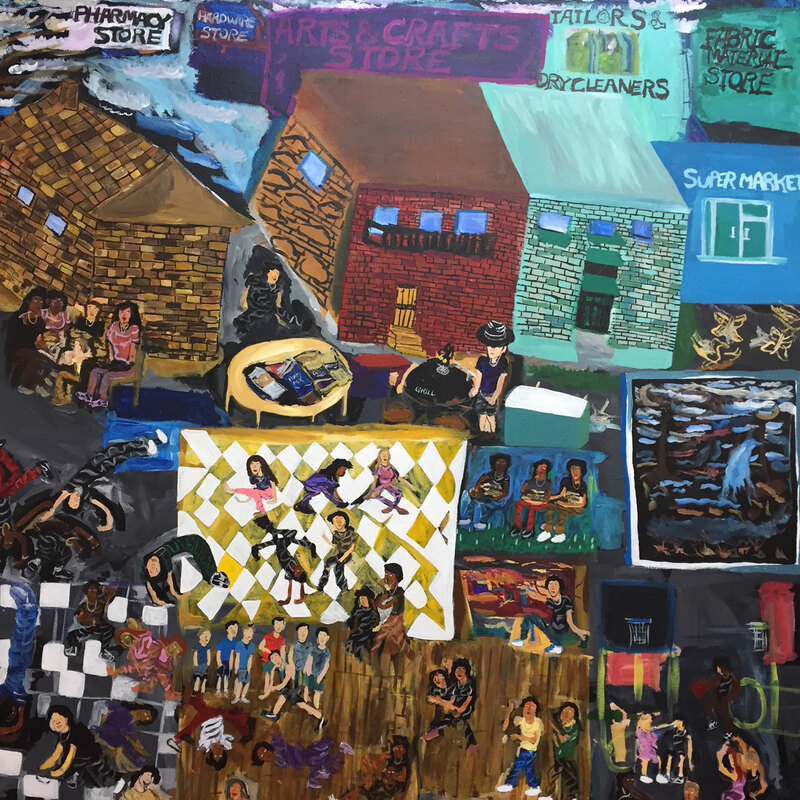 West has studied at Temple University and Fleisher Art Memorial and has exhibited throughout the region including Art in City Hall, Savory Gallery, Fleisher-Ollman Gallery, all Philadelphia, and Gallery Aferro, Newark, NJ.